Sitting second last in the Serie A table, Carpi Football Club's 2-1 victory over Udinese earlier today may have been the most exciting event for the club on most occasions. But on this day there was one thing that surpassed the joy of a rare top tier victory for the home club; a goal from little known 26 year old winger Lorenzo Pasciuti to open the scoring in today's match put his and the club's name into Italian football record books. On January 9, 2016 Lorenzo Pasciuti of the small northern Italian commune of Carrara became the first Italian player in history to score a goal in all top 5 divisions in the country, all while playing for the same club. Having launched his modest football career with the youth ranks of club AlbinoLeffe, Pasciuti played first team football with three clubs before joining his current side Carpi in 2009. At the time the club was playing in Serie D, the fifth tier of Italian football. At the end of the 2009-10 season Carpi was promoted to tier 4, the Lega Pro Seconda Divisione. Finishing in first place of Group B in the fourth tier, it took the club a single season to be promoted once more, this time heading to 3rd tier Lega Pro Prima Divisione. During this instant promotion season Pasciuti scored five times and had now put the ball in the back of the net in both the 5th and 4th tiers of Italian football while playing for Carpi. In the club's first season in the Lega Pro Prima Divisione, Carpi managed to secure a promotion playoff spot after finishing 3rd in the league standings. But their debut in Serie B would have to wait another year after losing in the promotion playoff final to Pro Vercelli. With Lorenzo Pasciuti now a regular in the side, and despite him scoring just one goal in 22 appearances on the season, Carpi was once more in a promotion playoff battle at the end of the year. This time around however, Pasciuti's club would claim their spot in Serie B after defeating F.C. Südtirol and US Lecce, with Lorenzo appearing in all 4 playoff matches. Carpi's first season in Serie B (the club's first time in Italian 2nd tier football since 1928) was pretty balanced with the club finishing right in the middle of the pack in 12th place. 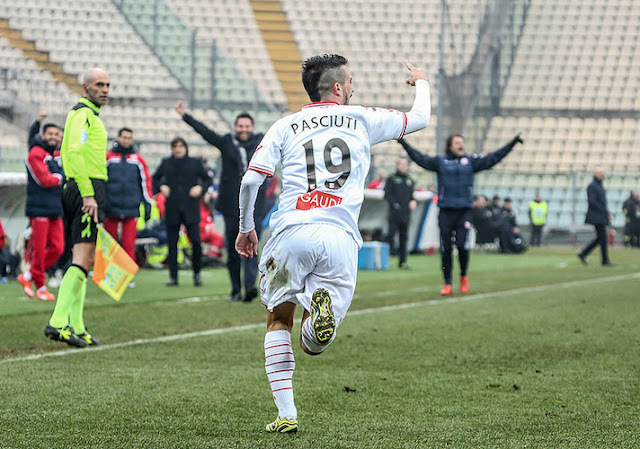 The 2013-14 season also marked Lorenzo Pasciuti's first ever goals with Carpi in Italy's 2nd tier. Pasciuti scored twice on the year; once during an away 4-1 away thrashing of Padova and the other during a surprise 2-1 win against eventual league winner Palermo (also on the road). The club's second year in Serie B was near flawless. With 22 league wins in 42 matches, Lorenzo Pasciuti and Carpi Football Club 1909 were headed to the top tier of Italian football having finished first in Serie A at the conclusion of the 2014-15 season. Lorenzo scored three times on the year, but unlike the previous season, this time every one of his goals came in front of the club's home crowd. Lorenzo Pasciuti was now headed to Serie A with only a single goal separating the (then) 25 year old from an unknown commodity, to Italian football record holder. Carpi's start to the 2015-16 season in Serie A was as tough as one could imagine. 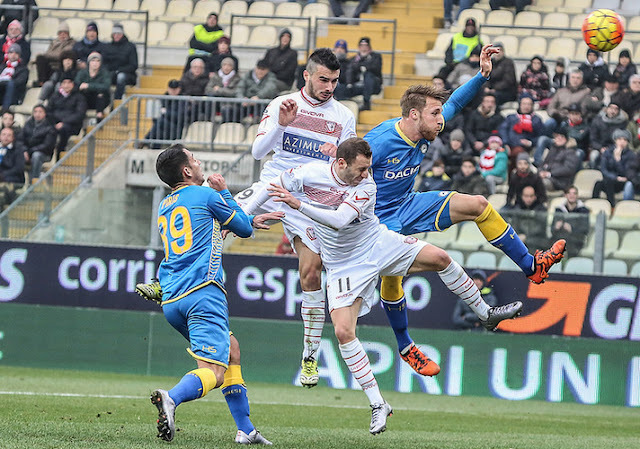 In the club's first 18 matches Carpi conceded 33 times for a grand total of 11 losses, 5 draws and only 2 wins. Pasciuti was not enjoying a great time either; having started just a single match in the previous year from the bench, Pasciuti was now not in the starting line-up in the first 11 matches of the season (8 on the bench and 3 missed due to injury). On November 8, 2015 manager Fabrizio Castori started Pasciuti for the first time on the year and what would be Lorenzo's first ever start in Italy's top tier. Getting back to regular health Pasciuti was given more time on the pitch and had started in three matches which saw him play the entire 90 minutes; all leading up to a day the club, the fans and Lorenzo Pasciuti himself would never forget. Although it didn't seem that many knew it at the time, Pasciuti's 26th minute header against Udinese earlier today was actually quite a remarkable feat and the first of its kind in Italian football. In just 6 years Lorenzo Pasciuti has not only helped his club to four promotions and a first appearance in Italy's top tier since 1922, but has also in the process become the first footballer to ever score in all top 5 tier of Italian football with one club.